Little Tiger: Fire Truck, Submarine, Spaceship is a fun early learning app. With Little Tiger, younger kids an go on various exciting adventures with a fire truck, a submarine and a spaceship. 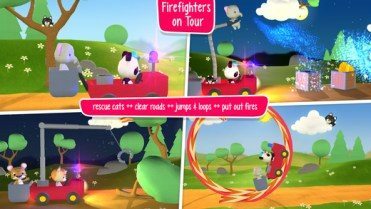 I thought that this was a really cute app and one that younger kids would definitely enjoy. The app features 4 cute animals friends: a panda, tiger, unicorn and elephant. There are 15 mini games to play, as well as other challenges. When playing with the fire truck, kids can put out fires, rescue cats from trees and clear obstacles from the road. Fly along in the spaceship and head for undiscovered planets, too! When diving underwater with the submarine, kids can either use it as a boat or go underwater when they convert it to a submarine. The Little Tiger app aims to help refine motor skills, as well as promote logical thinking. If you are looking for a fun early learning app for your little one, I would definitely check this app out. I think this would be a fun app to play together with your preschooler!